Later, as an ocean-racing sailor, I acquired the skills to hand-stitch ripped sails using an old-fashioned sailmaker’s palm. The highlight of that was crossing the TransPac finish line under a spinnaker proudly flying my shorts, which I’d inadvertently stitched into the seam and refused to cut free. I may look the part of a seamster, but don&apos;t be fooled. 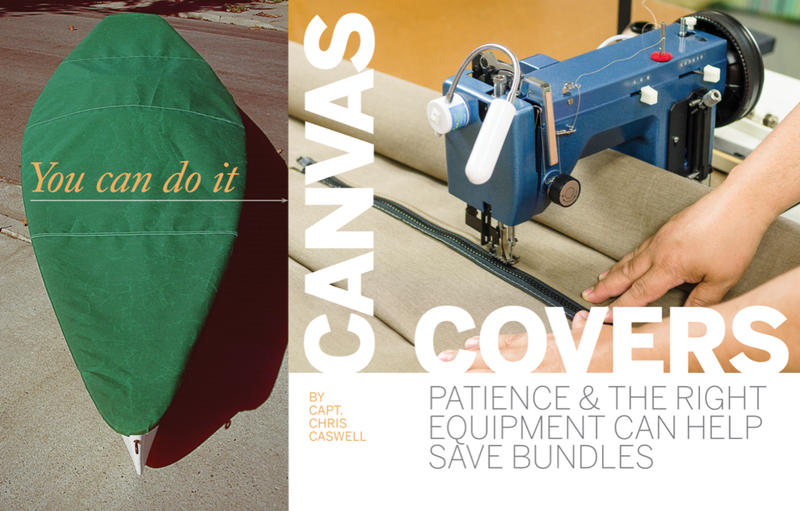 My interest in sewing perked up recently when I needed a cover for my 14-foot rowing wherry and I got some quotes from canvas shops. At first, I thought the prices quoted were offers to buy the boat, not make the cover. And then a friend said, “Hey, do it yourself!” It has turned out to be enjoyable, as well as a big money saver. Nearly everything else on a boat is something the average handyman can tackle: bottom paint, varnish, minor fiberglass work, even basic engine maintenance. But I’d always been in awe of canvas makers because it seemed so, well, mystical. Since then, I’ve learned two things about making canvas covers and other things for my boat. First, it isn’t as hard as it looks. Second, it isn’t as easy as it looks. But I have a secret weapon: I bought a sailmaker’s sewing machine and, oh my, is it great. 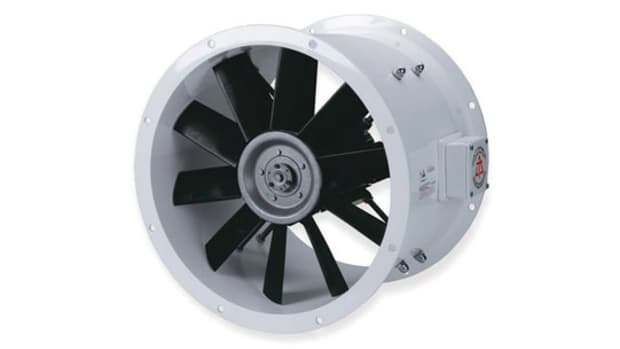 There are a number of different brands available, but I chose one from Sailrite (www.sailrite.com) for several reasons. First, Sailrite has been in business for decades and now has the second generation of the Grant family running the show. Second, I’ve never heard a bad word about Sailrite machines, and I know a lot of people who have cruised around the world with them. Some have even augmented their income by doing canvas repairs for other cruisers. Last, Sailrite is really good about support, and their free catalog is a one-stop shop for everything from needles to fabrics. I chose the Sailrite Ultrafeed LSZ-1 (about $700) because it offers both straight and zigzag stitching (the $600 LS-1 is straightstitch only). Both have a powerful motor and cogged belt drive to prevent slippage and stalling, but the most important feature has proven to be the “walking presser foot,” which grips the fabric and moves even bulky seams past the needle. I’ve run ten layers of coarse fabric, plus a leather reinforcement, under the needle, and the machine wasn’t even breathing hard. 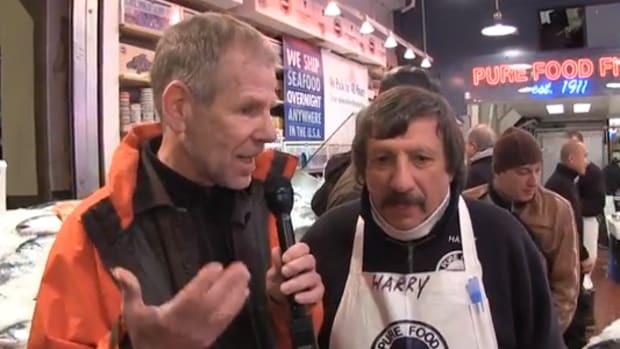 Famous last words: How hard can it be? By the way, when referring to canvaswork, it doesn’t mean you’ll be dealing with the stiff canvas that faced sailors on HMS Bounty. Canvaswork is simply the nautical term that refers to nearly anything made of fabric, even if it’s a modern synthetic of gossamer weight. Before you begin any project, whether boat cover or bimini top, take a walk around the docks to see how the professionals do it. 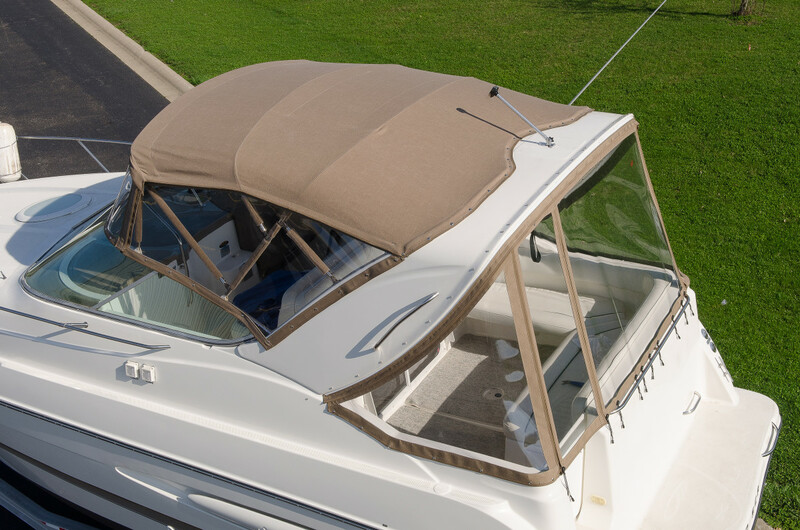 In the case of boat covers, most are made with athwartships panels so that rain sheds rather than puddles on the seams. Since my tender has a sizable gunwale, I decided not to install snaps or other fasteners and, instead, planned to secure it with a drawstring that tightens the canvas under the ‘wale. 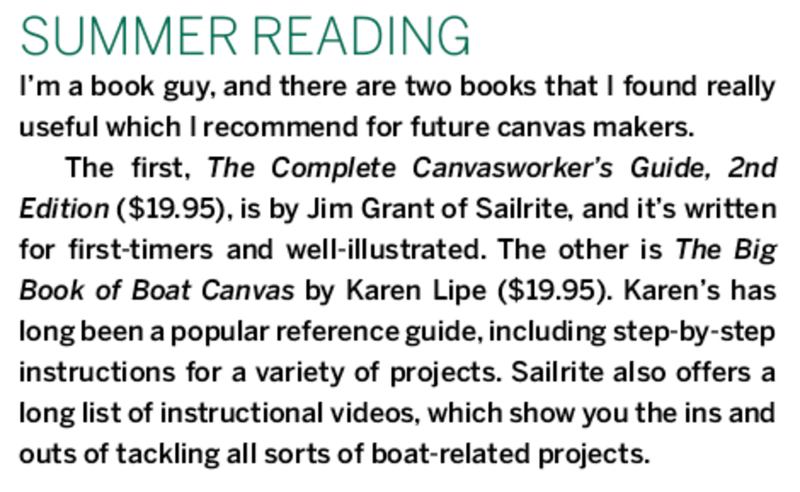 A good start would be to look through the free Sailrite catalog, which not only offers everything you need, but includes a host of excellent videos that show you exactly how to make a variety of boating goods. You’ll soon discover there are many projects that can improve your boat and will easily justify the investment in a good sewing machine: bimini tops, duffel bags, cockpit cushions, awnings, windscoops, dodgers around the bridge, instrument panel covers, dinghy chaps for RIBs—the list is endless. 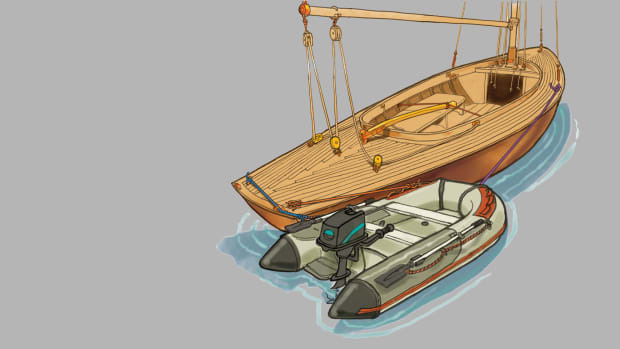 Let’s take a look at what I needed for my boat-cover project. You’ll need sturdier thread than you’d use around the house, and a V-69 polyester sailmaker’s thread came recommended. This is a high-strength polyester that is impervious to sunlight and is equally resistant to abrasion, saltwater, and mildew. It comes on a big spool holding more than 3,600 feet, which is your first indication that you’re now playing in the big leagues. 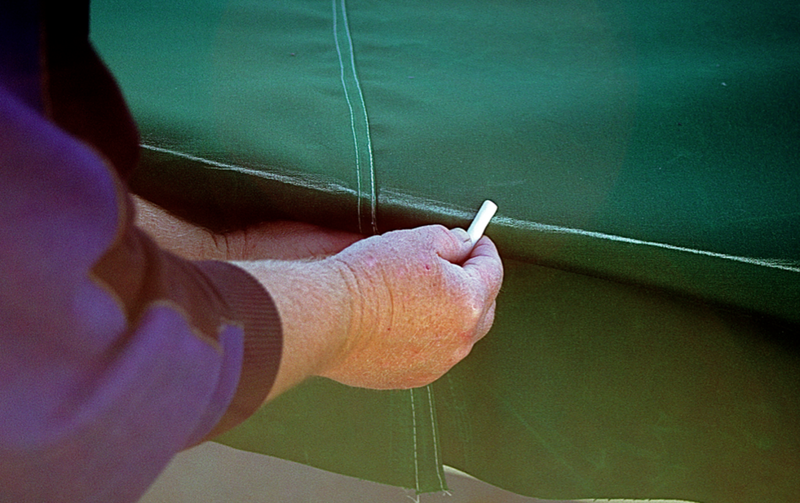 Sailrite recommends a #18 needle for 3- to 6-ounce fabrics, including all Sunbrellas. Be sure to buy several spares because you’re going to break a few while you hone your skills. You can get the job done without the following items, but they will make your work easier and the finished product even more professional. 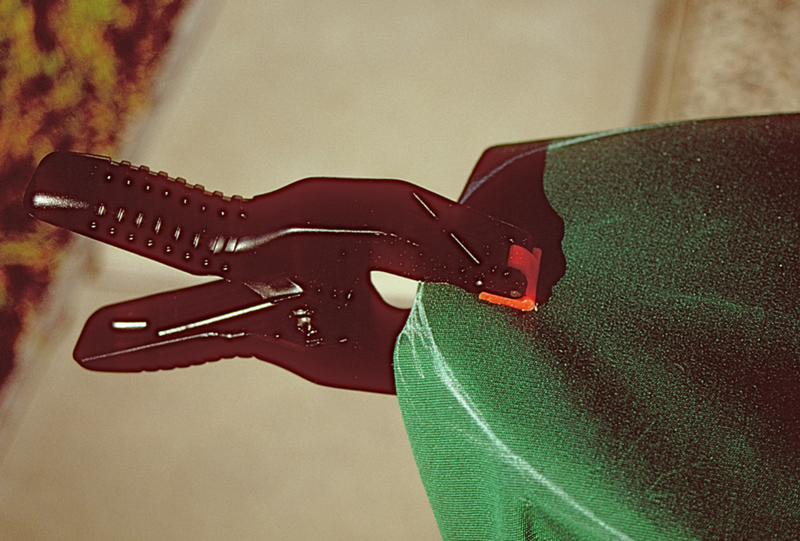 Get a good, sharp pair of pinking shears to cut the fabric so it doesn’t unravel. 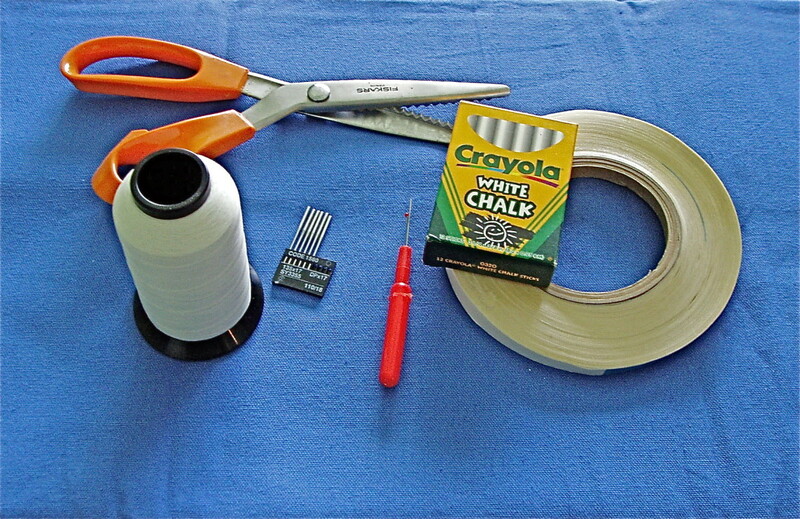 A box of white chalk will mark your fabric for sewing without leaving pencil marks that last forever. Throw in a roll of Seamstik basting tape and a stitch ripper (more about these later), and you’re ready to sew. You can find most of the needed materials at any craft store. Your starting point is what canvas makers call a blank—a roughly shaped piece of fabric that covers the entire boat with enough excess for seams and finishing edges. Sunbrella comes in 46- or 60-inch widths and I went with the narrower width because I wanted a Kelly green color that wasn’t available in the wider material. 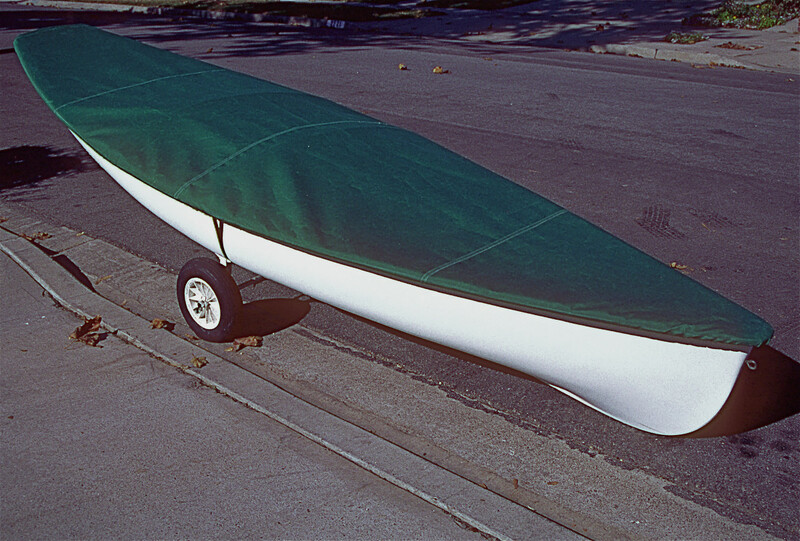 My 14-footer required four 46-inch-wide panels sewed into a blank that covered the entire boat. Since the tender tapers at both bow and stern, the blank roughly follows that shape. Number the panels in sequence with white chalk (it will rub off) so you can reassemble them in order. Big Tip: Before you start sewing on the real project, practice (a lot) on scrap material. Learn to control the speed of the sewing machine, practice sewing straight lines, and understand how to use forward and reverse to over-stitch the thread at the start or end of a seam. Probably the most important skill is learning to sew across a seam, especially one with multiple layers of fabric. For the most part, covers are made using straight stitching, so you won’t yet have to bother with zigzag stitch patterns. Chalk is the ideal marking tool as it stays on when you need it to and rubs off when you don’t. Two items I mentioned earlier became my best friends and are invaluable for beginners (and experts, too): Seamstik basting tape and a stitch ripper. The double-sided basting tape eliminates the pins needed to hold a seam together as you sew and, designed for acrylics, it really holds stiff fabrics in place. When your mind wanders and your seam follows along, the stitch ripper can quickly remove the offending thread. A downside to the basting tape is that it can gum up some needles, so keep a cotton swab with alcohol or thinner handy for cleaning the needle. Professional canvas workers don’t bother with basting tape or needles: They have the experience to stitch flawless seams without such aids. Perhaps I’ll do without basting tape after I’ve sewn a few miles of seams but, for now, the double-sided tape is a godsend. A point to remember here, however: A slightly wandering stitch is no less strong than a railroad-straight stitch. It just doesn’t look as good. 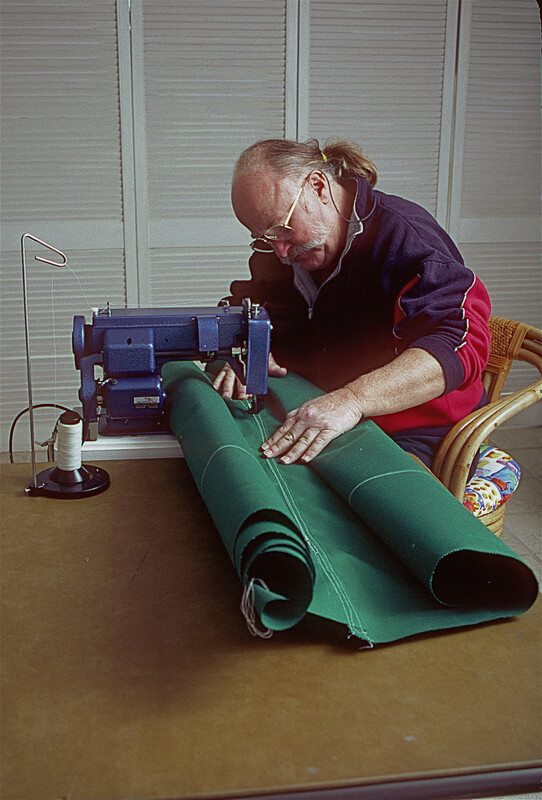 The trick to sewing large sections of fabric together is to roll them into tubes so they fit under the arm of your sewing machine. You can keep them in a tight roll by securing them at the ends with clothes pins, large paper clips, or binder clips. Using clamps like these help fit the material as if it were sewn together before you make anything permanent. When the blank was finished, I spread it over the tender and used spring clamps to hold it to the rails while I marked the exact shape with white chalk. Once the marking was completed, I spread the blank out on the dining room table and marked a second line outside the first to allow for a wide hem that would carry the draw cord. I took the now-trimmed blank back to the boat for a final check. Using several spring clamps to hold the fabric in position, I found that I had to make three darts at the bow and one at each corner of the stern so the material wouldn’t pucker. In this case, I used the basting tape to secure the fabric with a big fold underneath. Returning to the dining/sewing table, I stitched the dart seams, and then I cut away the flap underneath. Starting at the stern end of the blank, I stitched my way around using my chalked line as a guide. I sewed the drawstring seam with the cord in place to simplify feeding it through later, and this was a clever plan that worked perfectly right up to the point where I stitched through the cord accidentally and had to rip out about two feet of seam. If I were doing it again, I’d still put in the cord, but I’d sew a lot more carefully. Holding my breath, I took the finished cover and put it on my boat over a couple of wooden bows I’d made to hold up the center. To my delight and no small surprise, it fit perfectly, without flaws or wrinkles. Of course, the seams are sometimes a bit freeform, but it looks and works great. Through a couple of rainy winters, it’s kept my boat clean and dry. At $20 per yard, I spent only $100 to purchase five yards of 46-inch wide Kelly green Sunbrella (pricing varies by fabric). The cone of thread was $13 for 3,600 linear feet, and I spent $9 for 50 yards of Seamstik that should last me forever. In this one modest project, I paid for the sewing machine several times over. Since then, I’ve used the machine to make a couple of hatch windscoops, two custom duffel bags that fit perfectly into our lockers, and I replaced a tired seat cushion. I even used it to repair my favorite canvas briefcase that had come unstitched. Today, I can’t imagine not having a sailmaker’s sewing machine. If you’re anything like me, you’ll find dozens of uses, from windlass and instrument panel covers to a bag for stowing an outboard in the lazarette. Just don’t tell my wife that I can sew.